As I wrote in my review of the BSG series finale, it was remarkably painful to see such an amazing science fiction show end with such a sloppily written finale. The one-two combo punch of reducing the only viable explanation for the larger than life happenings of the plot to the supernatural and the arbitrary snap decision of the entire cast to chuck their entire civilization into the sun makes for a real stinker of an ending. But to understand the magnitude of how poor an ending it was, we have to put its impact on the entire series into proper context. Thus, I now bring to you a retrospective. Let's take a look at what effect the big reveals at the end of the series have on earlier episodes. In the pilot miniseries, Head Six is originally strongly implied to be Caprica Six or a copy of her placed within Baltar's mind. However, at the end of the series when we're finally given an explicit answer to what she was all this time, the answer we're given is unmistakably supernatural. We learn that she's not Six at all; she's not even a Cylon. She turns out to be a non corporeal entity and claims to be an "angel of god." This explanation and the actions she performed throughout the series leave no room for a rational alternative explanation, so we're forced to accept a supernatural explanation as the only explanation. 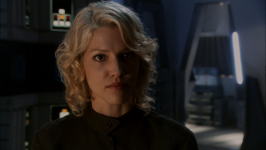 In the Miniseries, there are numerous lines from Head Six directly or indirectly implying that she is Caprica Six or a copy of her placed in Baltar's head, such as when she tells Baltar "your escape is a temporary one at best. We will find you." In Pegasus, Head Six in shock exclaims to Baltar "it's me!" upon witnessing Gina for the first time. In Resurrection Ship, Part 1, Head Six tells Baltar that she misses sports from when she lived on Caprica. In Kobol's Last Gleaming, Part 1, why does Head Six, an angel of god, feel sadness over Baltar's infidelity to Caprica Six? In Scattered, why does Head Six lie to Baltar by saying that he would be both metaphorically and literally the father of Hera? 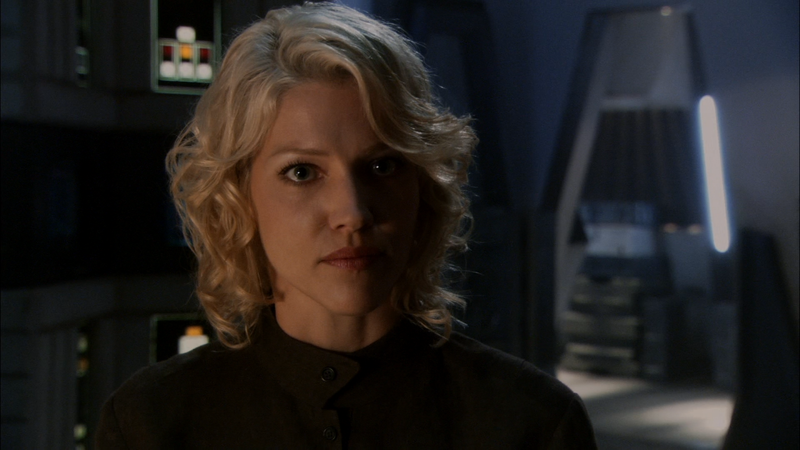 In Resurrection Ship, Part 2, Head Six says that god will not forgive the sin of killing tens of thousands of Cylons. Taken in the context of Head Six representing Caprica Six' views on the matter as a counterpoint to Gina's conflicting views, this makes sense. Taken in the context of Head Six being an angel from god, the line makes no sense at all. In Epiphanies, why did Head Six advise Baltar to use the nuclear device to somehow deter Adama from killing Hera? It didn't end up being used for anything remotely resembling that purpose. In Downloaded, why would Head Six be unaware that Hera was not dead? In Razor, the hybrid says a bunch of prophetic crap about Starbuck (and the Cylons too) that only could have come from supernatural knowledge. In Crossroads, how did Starbuck resurrect? God must have brought her back. In He That Believeth in Me, why did Starbuck not know she was an angel? Why did she think only a few hours had gone by since she died? Why did god give her fragmented false memories of being to Earth and a suspiciously pristine viper? We can only assume god wanted to test the faith of the fleet. In The Road Less Traveled, how did Leoben know where to look for Starbuck? How did Starbuck know he was coming? The only rationalization for this, again, is god. In Revelations, why did All Along The Watchtower direct the final four to Starbuck's mystical viper? Why and how did the mystical viper point the way to Earth? How did Starbuck figure it out? The only answer to any of these questions is divine intervention from god. In Sometimes a Great Notion, How did Starbuck's viper and charred remains get on the planet? The only answer is god placed it there for her to find. In Someone to Watch Over Me, how did Starbuck's dad learn All Along The Watchtower? Must have been god. 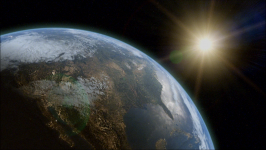 In Daybreak, how did Starbuck find the real Earth? God must've helped her. In The Plan, Leoben's flash forwards showing him events which have not yet occurred have no explanation other than visions from god, much like the opera house visions that Roslin, Caprica Six, and Athena all shared. Unfortunately though, the sloppy writing wasn't limited to plugging plot holes with god. The revelation of the real Earth in the finale created the whopping Tomb of Athena problem. In Revelations, Gaeta confirmed that the constellations in orbit of that planet matched the Tomb of Athena from Home, Part 2. However in Daybreak, we learn that that Earth was a big fake. The real Earth is the one they find in Daybreak. The trouble is since the Earth depicted in Daybreak is quite clearly the Earth we're all living on now, we know the constellations match there too. But that simply can't happen. The constellations can't be identical in both places. Even then, aside from screwing up long term continuity, the finale wasn't even internally well polished either. Head Six misuses the law of averages in one line, Adama states an impossible figure when mentioning how far away Earth is from where they were before, and the whole plot seems to conspicuously ignore the ice age present at the time on Pleistocene Earth. In Water, Adama says to Lee regarding his second guessing of shooting down the Olympic Carrier: "leave the second guessing to the historians." Since there will never be any historians to judge any of the actions any of them took, this statement turns out to be most ironic. In Final Cut, Adama orders Racetrack to preserve the Caprican Life magazines, ostensibly because preserving their culture and history was of paramount importance. In the ending they did precisely the opposite of this. In Resurrection Ship, Part 2, Adama tells Roslin to "never give up hope" about beating her cancer, but that's exactly what they do by the end of the series. She decides for no clear reason whatsoever to just give up on Hera's magic breast cancer cure and chooses to die. In Razor, Apollo asks Adama if Cain and Shaw were wrong. Adama responds that history will have to make its judgments and that the first draft of history is written in their logs. Since as a consequence of the ending there will never be any historians or any surviving logs, the entire conversation is rendered most distinctly moot. In Exodus, Part 1, Adama says: "One day you will tell your children and your grandchildren that you served with such men and women as the universe has never seen. And together you accomplished a feat that will be told and retold down through the ages. And find immortality as only the gods once knew." Yeah, some immortality. Thanks to their chucking civilization into the sun, their deeds were surely forgotten within a few generations. In Exodus, Part 2, Dee says to Apollo: "We have to find Earth. If we don't there'll be no one to remember a man named William Adama or a Battlestar named Galactica." Little did she know nobody would remember anything that happened to any of these people anyway because of the events of the ending. In Unfinished Business, Adama said: "I let this crew and this family disband. And we paid the price in lives. That can't happen again." But that's precisely what Adama did. He let his crew and family disband and they paid the price in more lives than ever before on brutish and cold Pleistocene Earth. Had they stayed together and preserved civilization, that would not have happened. In Daybreak, just before launching the attack on the colony, Adama turns Cottle away from volunteering claiming that the fleet can't afford to lose a doctor. But at the end they give up a lot more than what a skilled doctor can do. They give up modern medical care entirely and a whole lot more technologies that save and extend lives. In Daybreak, Baltar and Caprica Six wonder if Hera will be all right. Their angels assure them that she will be. However according to our archeological evidence, Mitochondrial Eve died as a young woman. But I guess Hera surviving just long enough to bear children and thus become Mitochondrial Eve was good enough for god! In Daybreak, Lee says to Kara that she won't be forgotten. But the truth is their entire civilization and everything that they ever accomplished will be forgotten! I often tell people that BSG was a fantastic science fiction television series and to try not to let the crappy ending get to them too much. But the truth is that's just my love for the show's good years getting in the way of a painful reality. The reality of the situation is that this sloppy ending greatly diminishes the entire series. All of the details catalogued in this article prove that. Make-it-up-as-you-go-along storytelling and poor preplanning have mid-air collided with deus ex machina to produce an ending so bad it nearly ruins all the material leading up to it. This ending greatly diminishes the potential for any new material to be as dramatically compelling as well. Now that god has transitioned from being a concept to a character and the Colonials chucked all their technology into the sun, there is obviously no story left to tell about them outside of prequels, but even prequels are damaged by this ending. Ads for Caprica touted the phrase "the future of humanity begins with a choice." That slogan is a final unintentional irony for us in this saga given the fact that the end of the story is all about how god eliminates all free will through his divine interventions. I've said it before and I'll say it again. BSG deserved better than this. BSG deserved an ending as well crafted as Star Trek DS9's. And since Executive Producer Ronald D. Moore was part of the creative team that crafted DS9's incredible ending, he should have known better than to deliver us something this sloppy. While RDM certainly deserves to be proud of the many praiseworthy things in his show, he should most certainly be ashamed of himself for this travesty of an ending to what was otherwise the greatest science fiction show since Star Trek. So say we all. 33: Head Six suggests that Amorak disappeared because god is looking out for Baltar. When Baltar rejects this idea, Amorak returns and Head Six suggests that god punished Baltar for his lack of faith. Baltar then repents which then coincides with the threat Amorak posed being wiped out forever. Head Six suggests Baltar's repentance is the direct cause of Amorak's elimination and the elimination of the threat he posed. However, none of this is necessarily supernatural in nature. It could easily just be a coincidence. Head Six even suggests a "more logical and useful explanation" after Baltar asks for it; which is that the Olympic Carrier's been infiltrated by Cylon agents which explains its disappearance and reappearance. Six Degrees of Separation: Head Six suggests that Shelley Godfrey appeared and persecuted Baltar due to his blasphemy then disappeared due to his repentance, however this easily could have been a coincidence. Indeed, in The Plan, it was explicitly depicted as such. Flesh and Bone and The Hand of God: Leoben and Head Six both suggest that scripture foretold the confrontation between the fleet and the Cylons at Kobol. However, this could easily just have been a coincidence. Incidentally, the Cylons (and thus Leoben) probably already knew where Kobol was and could tell that the fleet was heading in that direction and would soon stumble on it. The Hand of God: Head Six suggests that Baltar guessed the correct location of the storage tanks because he had faith in god. However, there's nothing necessarily supernatural about that. Baltar said there's "no other logical explanation," but he's wrong. The logical explanation is that he could have simply gotten lucky. He That Believeth in Me: It's strongly implied that Derek's recovery is a miracle from god, but Derek's recovery isn't necessarily rooted in the supernatural; he could have gotten better all on his own despite the coincidence. Escape Velocity: Many people complain that when Baltar is lifted up off the ground at the end of the episode that it should have been obvious to those around him that he was supernaturally levitating off the ground, which is why they were so visibly surprised. However, if you look closely, he's not actually levitating.